So there I was, finally fixing up my attic heating. The last thing I needed was an exact reading of my floor temperature. To make sure that the heating is working as it’s supposed to. The problem was… I had nothing to measure it with. 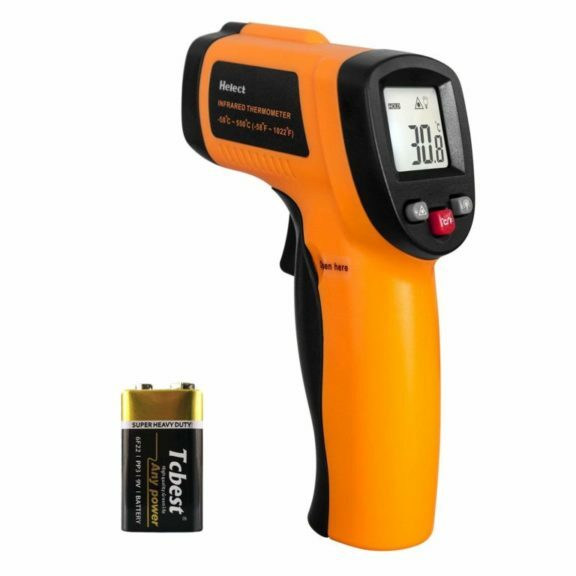 So, I decided to go and get myself an infrared thermometer. Because there is a whole world out there. A whole world of infrared thermometers. I didn’t need any of that. I was just looking for a thermometer that would read my floor and wall temperatures correctly. Easy stuff. But while I was looking for one… I ended up learning A LOT about these devices. And What’s A NISA Certification? Side note: This is a simple review. This ain’t a physics lesson. We’re a survival magazine, after all. I’m going to focus on the usability and the QUALITY of the actual product. As well as all the things that you need to know before buying it. It’s the #1 thing that separates the best infrared thermometers from the rest. Side note: I couldn’t find a single infrared thermometer that had less than 2% accuracy. I don’t know about you, but that’s not a whole lot of to me. Unless you’re working in a research lab, that one Fahrenheit won’t make a big difference for your readings. Takeaway: All infrared thermometers on the market today are fairly accurate. Most infrared thermometers come ready to use right out of the box. Meaning that you can measure walls, pipes, floors, metals and other solid surfaces around the house without adjusting the settings on your thermometer. 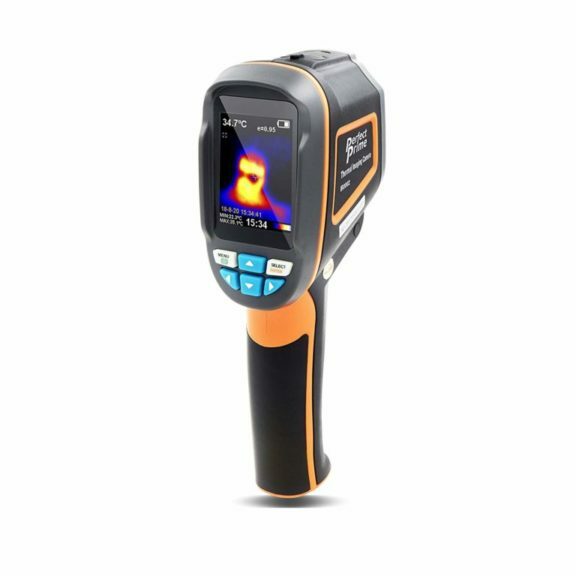 You’ll need to get yourself a professional infrared thermometer with a setting called adjustable emissivity. The emissivity scale goes from 0 to 1 and you’ll need to tweak it based on how reflective the surface is. For example, the manual on mine says that 0.97 emissivity is good for ice and 0.95-0.98 for water. 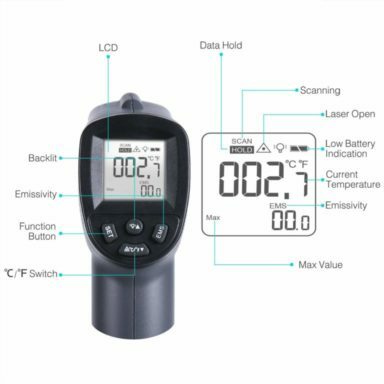 Most infrared thermometers on the market today ship with adjustable emissivity. Takeaway: You only need adjustable emissivity to measure temperature of surfaces like water and glass. Side note: Emissivity is usually LOCKED on 0.95 on cheaper infrared thermometers. Those will most likely be good enough for your needs. So far so good. But I’m leaving out one extremely important detail… durability. Because let’s be honest, we don’t want to buy a new infrared thermometer every year. We want to get one that lasts – a device that we can rely on. Warranty is the #1 indicator of quality. It’s a simple way to see if the company is willing to stand behind their product or not. And when it comes to infrared thermometers – most come with 2-3 years of warranty. The shortest warranty I managed to find was 30 days (!). Because there are products that look good on paper… but are loaded with issues in reality. “Made in China” is not bad. But combined with poor quality control, it’s a recipe for disaster. So, I double-checked that all infrared thermometers on my list have good customer reviews. P.S. There were quite a few thermometers that didn’t make it to the list because of customer complaints. Distance To Spot Ratio – is about the same on all infrared thermometers (12:1 or 10:1). Basically means that you can measure heat from far away. All modern thermometers have a good distance-to-spot ratio. Temperature Range – is well-covered on all modern thermometers. The lowest max temperature I’ve seen on a thermometer is 740 Fahrenheit. Most likely you’re never going to measure over 572 degrees (~maximum oven temperature). Temperature Reading Speed is THE SAME on all infrared thermometers – 500ms . You’ll get an instant reading no matter which one you buy. It’s is a common marketing trick – don’t fall for it as all thermometers are equally “fast”. Battery Life – the way these things work is that you shoot a few times… and get back to work. No matter which thermometer you have – the battery is going to last you for months. Fancy Displays look good, but you don’t need them. 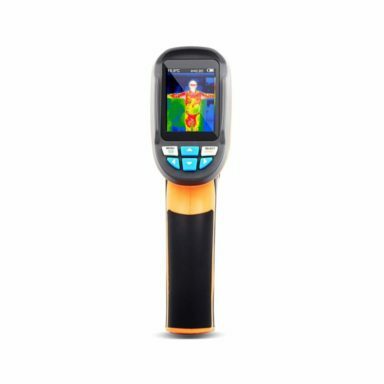 You’re getting an infrared thermometer to measure temperature… and you don’t need a fancy screen to do that. After hours of research, I ended up going with EnnoLogic eT650D Dual Laser. I can get reliable readings from about 2 – 2,5 feet away. The device also works from further away, but then the accuracy varies slightly. And is no longer within the “perfect 1%”. I like the dual laser feature for its precision. I can take a reading of a spot with ~5mm accuracy. While I don’t need that kind of precision, I can see how this is useful for car mechanics – for example. Plus the dual lasers just look cool. My kid loves them. So does my cat. The maximum temperature (1202°F) is about 200°F higher than on cheaper thermometers. If you hold down the trigger, you can a get continuous temperature reading of the surface that you’re covering. This way, you can scan your roof for insulation problems with one sweep. You won’t have to press the button 100 times over different parts of your roof. Finally, the device is very accurate. My readings have all fallen within 1% as is advertised by the company. 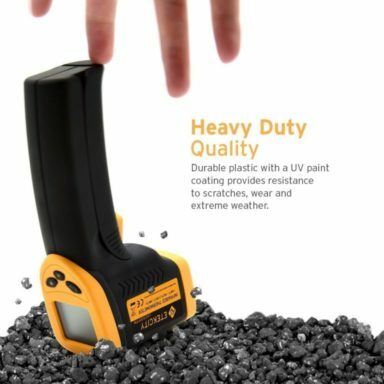 This infrared thermometer does everything that you might expect of one. There is not a single feature that I’m missing here. P.S. The user manual is in simple English and easy to read. Now let’s talk a bit about the downsides. I found the battery cover a little hard to open up. I had to use a screwdriver to get it open. Then – for some reason – it is common for people to break their battery doors when switching the battery. Personally, I haven’t had that problem. And I don’t imagine how someone might be able to break the battery door. Then again, I don’t know how clumsy the average American is. And now we get to my favorite part. 10 years of warranty baby. There is a certain sense of satisfaction in buying a product once… and getting a guaranteed 10 years of use out of it. This thermometer is built to last – kind-of reminds me of my G-Shock. 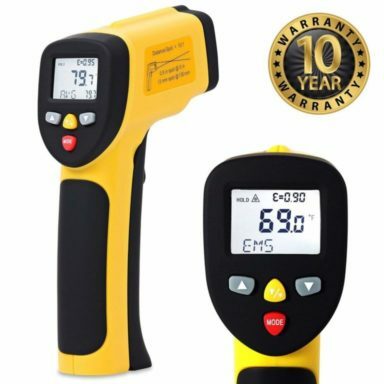 If you split the price over 10 years (120 months) you’re paying only ~40 cents per month for a quality infrared thermometer. It’s peanuts. You’re getting way more value than you would with a cheaper thermometer (that might break on you in a few years or months). 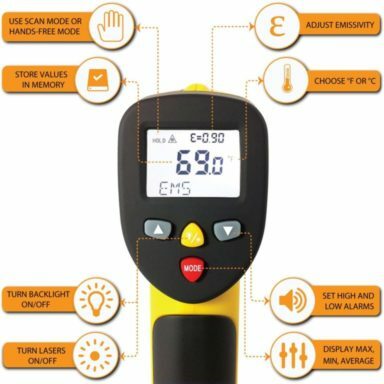 Ennologic eT650D costs a tad bit more than the cheaper thermometers on the market. 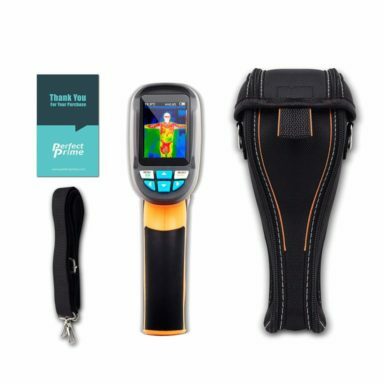 But the features are great – and the fact that the warranty lasts for 10 years make it the best infrared thermometer you can get. 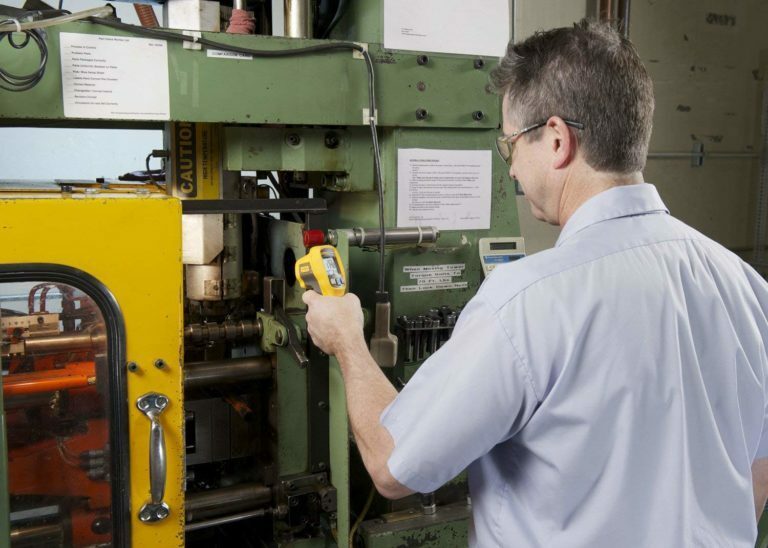 Fluke is the benchmark of quality when it comes infrared thermometers. They’re the brand that all other thermometers are measured against. 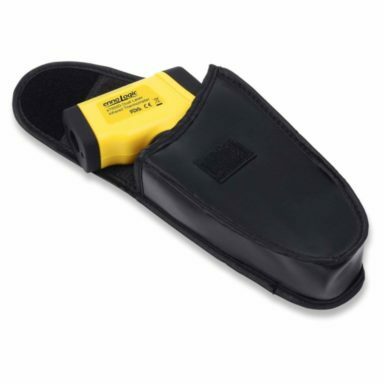 This resistance makes Fluke 62 Max suitable for professional use on construction sites and the like. 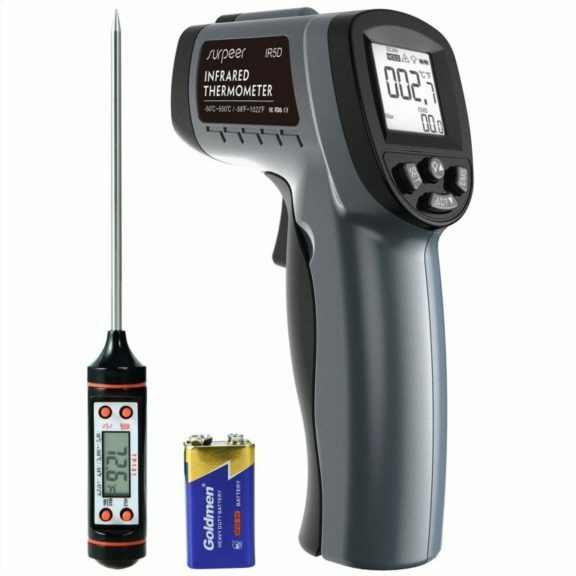 This is an infrared thermometer that you can bang around without a problem. First, There have been cases with the trigger failing after a few years of use. If you’re lucky, you’ll still have Fluke’s 2-year warranty when the device breaks down. Side note: That’s why I appreciate Ennologic’s 10-year warranty so much. If the device breaks within 10 years, they HAVE TO replace it with no questions asked. That’s not the case with Fluke. Second, the manual is bad. There’s very little text and mostly pictures – kind-of like furniture instructions from IKEA. There isn’t even a table of common emissivities in the manual. Finally, Fluke 62 Max doesn’t have a data bank. You can’t record your readings. And there should be some way to do this. Especially at their high price point. Unfortunately, Fluke only gives you 2 years of warranty (compared to Ennologic’s 10 years). The temperature range is also more narrow than Ennologic (lower max. temp.). Not that you need it that high… but still. Finally, accuracy is 1.5% instead of the 1% that you would expect for the money. Otherwise… I would expect more from Fluke at its price point. Especially when we compare their 2-year warranty to Ennologic’s 10 years. Fluke 62 Max is not a bad device. It’s just that there are better, cheaper, and more reliable infrared thermometers out there with x5 longer warranty. Note that you can order Fluke 62 Max Plus with two lasers (just select the option in the menu). 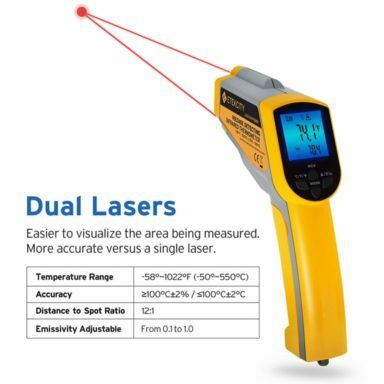 You’ll only need those 2 lasers if you measure objects up close – say 5-10 inches. Because the normal laser will always point slightly above the target area. The most special thing about Etekcity Lasergrip 774 is its price. 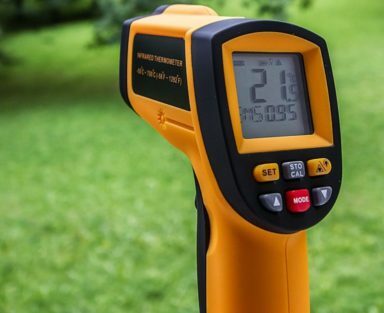 You can get yourself a bare-bones infrared thermometer for less than $20. Side note: For best accuracy, Etekcity recommends that the distance between the thermometer and object of measurement should approximately be 14.17 inches (36cm). The features are basic, but get the job done. A fair deal for the price. Etekcity 774 has everything that you need. With no frills attached. Still, there are many low-cost thermometers on the market. Why should you get this one? For the price I really can’t complain much. Majority of the customer feedback is also positive. Note that the issues above are not widespread. They happen because of bad quality control, as with all budget devices. At +-2% accuracy, Etekcity 774 is not as accurate as other thermometers. Finally, the build quality is not as strong as more expensive thermometers. I wouldn’t beat this one around too much. 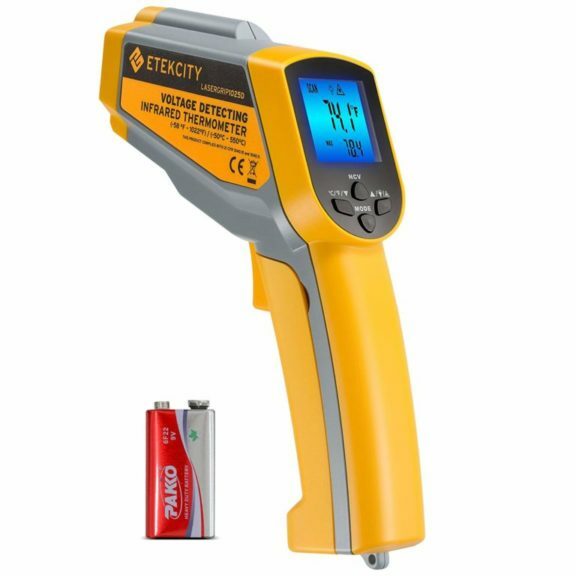 If you’re looking for a cheap and basic infrared thermometer – I recommend Etekcity 774. At the end of the day you’re getting exceptional value for your money. That you’ll have a hard time finding elsewhere. Note: If you want advanced features like adjustable emissivity on a budget, check out the Etekcity 1022D. Or the 1025D below. 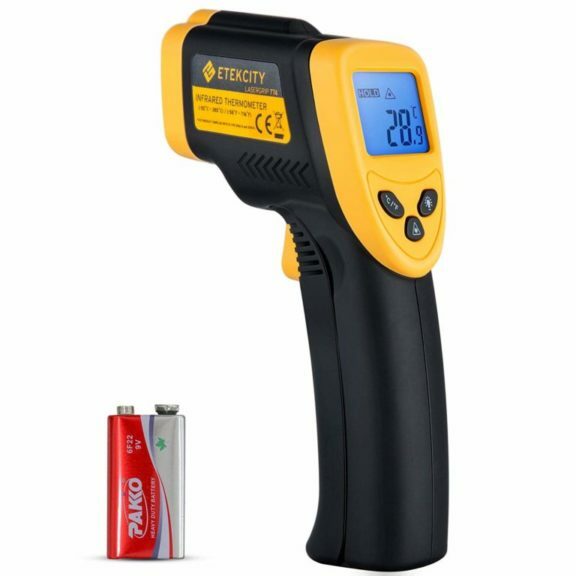 Etekcity 1025D is the Best Budget Dual Laser infrared thermometer that you’ll find on the market. Sometimes you need that extra precision that two lasers give you. Without breaking the bank. And that’s what 1025D is for. The best thing is, this thermometer is packed with a bunch of other features as well. 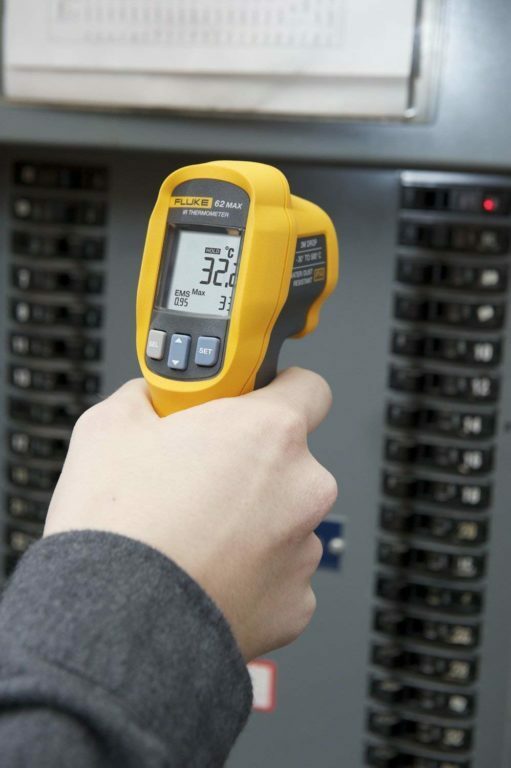 90V-600V Non-Contact Voltage Mode lets you safely test whether there is live AC voltage in the area – without actually touching it. Note that infrared thermometers usually don’t have this function. How it works: Point and shoot. Lines on the Lasergrip screen will indicate the voltage level. And steady beeping will indicate the location of the maximum voltage. Note that you won’t get a precise number of volts. 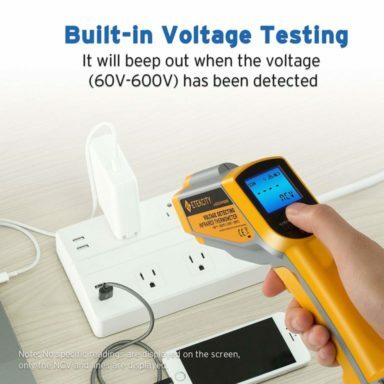 All you can do is test whether there is voltage or not. Otherwise, this thermometer has all the features you need and more. Good reviews all around, too. It’s hard to point out downsides considering how little you’re paying for it. If not for Ennologic’s 10 years of warranty, this thermometer would be #1 or #2 on the list. Just keep in mind that the voltage meter doesn’t show you the exact voltage… and you won’t be disappointed. 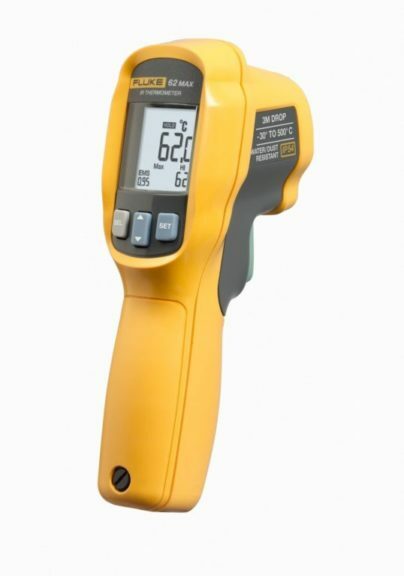 Surpeer IR5D is an infrared thermometer set that comes with an internal meat thermometer included. They made this one specifically for cooking. And let me tell you – that meat thermometer is a great thing to have. My meat roasting skills went through the roof ever since I got one. My wife still doesn’t know my secret. As in – how I managed to go from zero to hero in roasting meat. All in all, this is a fantastic infrared thermometer set for cooking… that does much more than you’d expect it to. 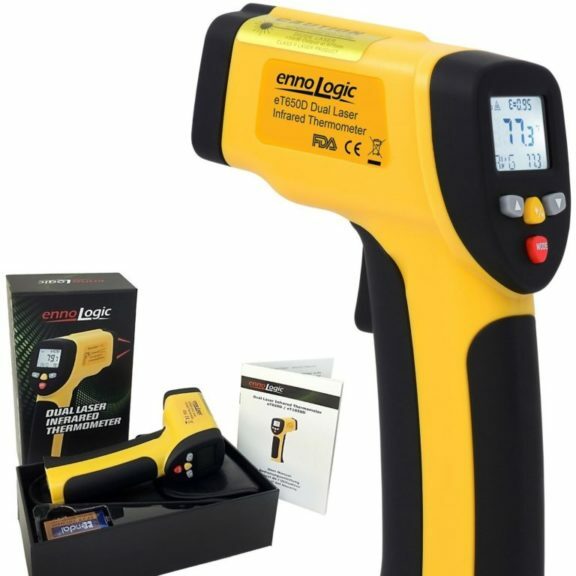 The infrared thermometer performs just as well as my Ennologic and Etekcity models. As I said before, I love the internal meat thermometer. If you’re looking for a cooking infrared thermometer, Surpeer IR5D is your thing. Especially when you consider how cheap this bad boy is… it’s a real no-brainer. I had a very positive experience with using the meat thermometer for roasting… if you don’t have one in your kitchen yet, you’re missing out. Helect is your basic Chinese infrared thermometer. You’ll find this model selling under many different brands on Amazon. And there’s nothing special about it – except for its dirt-cheap price. You get a functioning infrared thermometer with only the bare necessities included. It’ll get the job done. But don’t be surprised to when it breaks down on you… or when you find quality control problems. Helect gets the job done… but I wouldn’t rely on it long term. Get this one if you’re on a real tight budget. Or if you only need to use the thermometer once. Because it costs only a few bucks less than the Etekcity 774. If possible, I would go for Etekcity instead. At least you’ll get their 2 years of warranty. Wait… An Actual Thermal Imaging Camera? With a tiny screen attached to it? 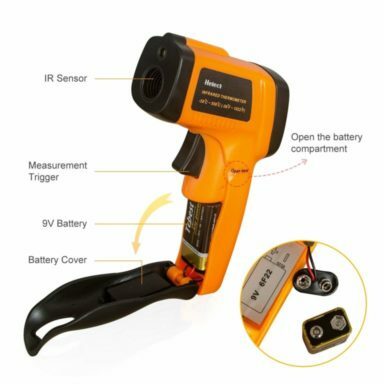 Perfect-Prime IR0002 is as good as it gets when it comes to handheld infrared thermometers. It does everything that other handheld thermometers do. It’s extremely useful for finding small temperature variations in an area. Let’s take an example – finding a heat leak on your roof. With a normal infrared thermometer, you would go around the roof looking for heat leaks. Since you only have one laser, you’d be looking for a needle in a haystack. With Perfect-Prime IR0002, you just take one look at your roof through the screen. And if there is a heat leak – you’ll see the temperature difference on the screen. But I won’t bore you too much with the specs on this one. You probably can’t afford it. The good thing is that you probably don’t need it either. 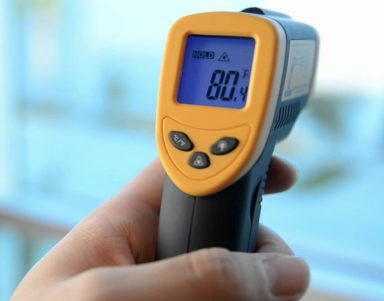 A normal infrared thermometer will be 99% enough for all your needs. It’s good to know what an infrared thermometer can do… and what it can’t do. In some cases, Infrared Thermometers can be MORE accurate than a surface probe. That’s because surface probes have their own temperature and that temperature can affect the surface being measured (by coming into contact with it). 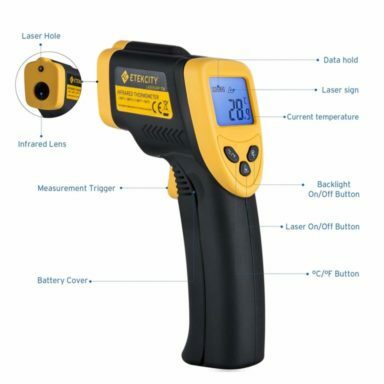 How To Use An Infrared Thermometer? And it’s probably obvious – but don’t stand too far away from your target. The laser gets weaker with distance. You’ll get bad readings if you’re far away. I usually measure as close as possible. But you don’t need to be extremely close or anything. Just shoot a couple of times and if the reading is constant – you’re game. The way infrared thermometers work is fascinating. And if the material is not frozen, the molecules inside of it are always moving. The higher the temperature of the material, the faster the molecules inside of it move. Molecules emit infrared radiation as they move. The more they move, the more radiation they emit. You know how metal gets red or white when it is real hot? That light is molecules moving inside metal. Super-fast. They’re emitting so much radiation that it turns into light. 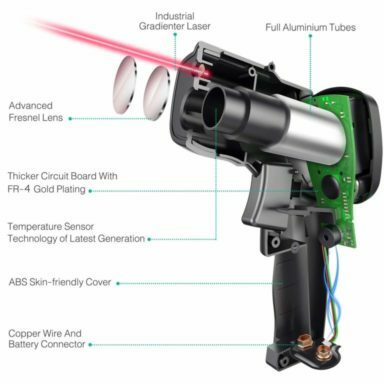 The lens captures the infrared light and transmits it into the detector. The detector (thermopile) takes the infrared light and converts it into heat. The more infrared light it takes, the hotter it gets. Finally, the heat from thermopile gets converted into electricity. And based on this electricity – the thermometer determines the temperature of the object. Side note: most articles out there explaining how these things work are very technical and, well… hard to read and understand. So I did my best to explain this in plain English. It is a very fascinating topic – you can learn more about it from the original sources here, here, and here. Also check out the wikipedia article on infrared thermometers. What Is A NIST Certification? 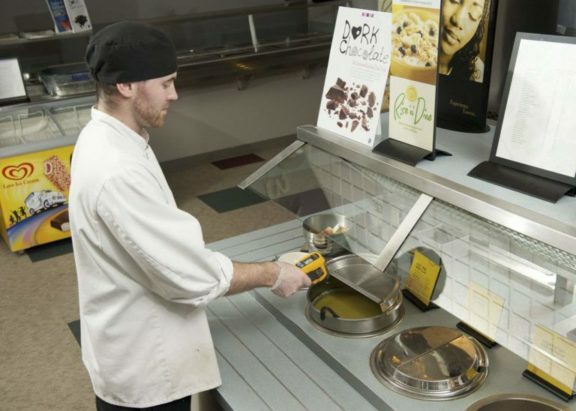 Infrared thermometers with a NIST certification (National Institute of Standards and Technology) have been calibrated according to the NIST standard. Basically, they have been field tested for accuracy by an official tester (third party). You have to pay a little bit extra to get a NIST certification. Certified thermometers are mostly used in hospitals and research labs. 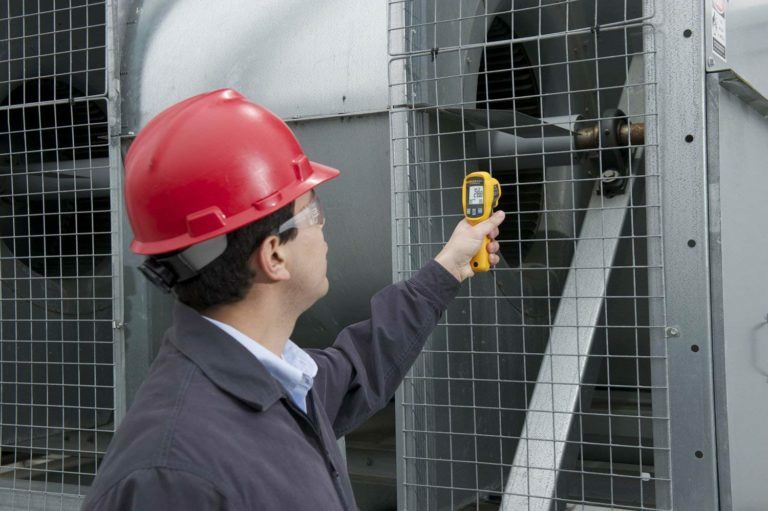 If you’re not working in a research lab, you don’t need a NIST-certified infrared thermometer. Infrared thermometer is a great device to have lying around your home. I hope you learned something new about infrared thermometers today. I also hope that I helped you pick the right infrared thermometer for your needs. If that’s not the case – and/or if you think that I should add something to this article – please let me know in the comments below.